A new electric bike hire scheme is gearing up for launching later this month. Carbon CLEVER Cycles is a new Highland Council-led initiative which will be up and spinning from August 18, with the target of a carbon neutral Inverness in a low carbon Highlands by 2025. It is a collaborative pilot project between Highland Council, Scottish and Southern Energy SSE and Co-Wheels Car Club.The plan could branch out if the pilot is a success. Initially there will be 12 bikes and two hire points when the trial scheme starts, but it is hoped it will expand across the city if it proves to be successful. SSE will contribute £40,000 to the scheme and will lease the bikes to the council at a cost of £15,000 per year. The two hire points are at Highland Council HQ on Glenurquhart Road and on Falcon Square in the city centre.The scheme will be operated by Co-wheels and an hour’s rental will start at £1.75. Inverness people will be able to use the bikes all day for a cost of £10 and tourists will pay £20. An e-bike is a bicycle which can be powered by electricity as well as propelled by pedals. Each bike has an integrated electric motor which can be used for propulsion, allowing people to tackle hills or headwinds with ease. To engage the motor, cyclists simply have to press a green button on the handlebars and a display will light up. A fully charged battery will last between 30 and 35 miles but the council will also provide portable chargers to be used when people stop off for a coffee or lunch.This will also save time for the next people using the bikes as each contraption takes about four hours to fully charge from flat. Keith Masson, Highland Council’s climate change policy coordinator, said: “The target demographic are not traditional cyclists but people who have not been on a bike for a few years who might want to give it a go. It is a great way to give people more confidence. The bikes are also very useful for nipping away from junctions quickly – which I think people will see as a real advantage. “The indication we have had is that it will be very busy from the off and we foresee that it will be pretty much fully booked throughout the summer. To register your interest contact Co-wheels on 0191 375 1050 or e-mail info@co-wheels.org.uk. 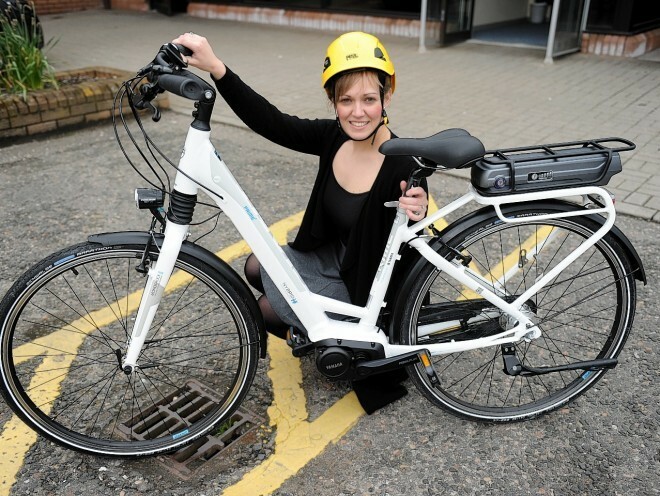 via Inverness electric bike scheme set for launch | Press and Journal.